The period between the 13th of February and the 3rd of March will undoubtedly go down as a major mechanical turning point in the restoration of the #18. It will also be remembered as a period of some of the hardest work we have performed; by the numbers that means over 2000 miles driven to get the drivers in Washington and over 800 volunteer hours spent in Independence over two weekends. While the full story would be worthy of any reality TV show (or our newsletter), the end result was that Dave, Rick and Forest – despite a few flat tires, rain, a broken axle, and a helpful guy named Lucky – were able to retrieve the drivers at the Mt. Rainier Scenic RR between Feb 13th and 17th. 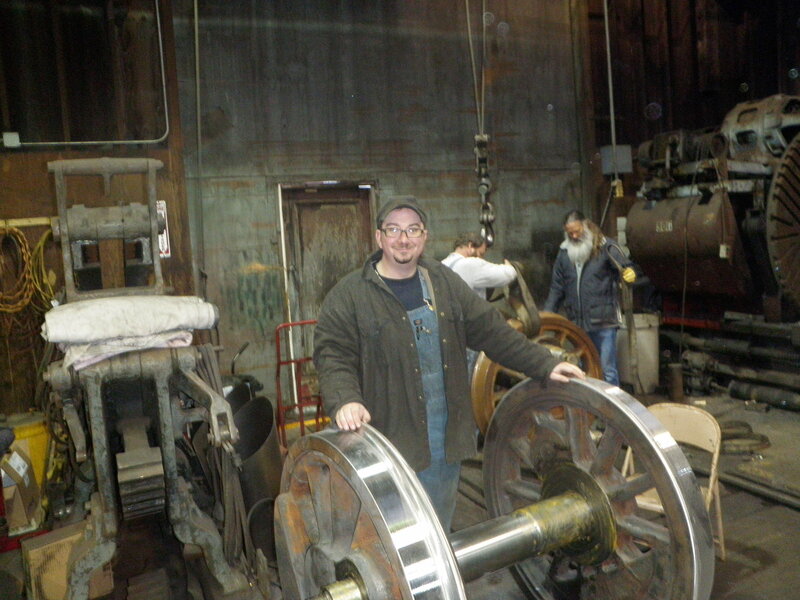 Stathi and his crew at MRSRR did a great job at rebuilding the drivers. CMO of the Mt. Rainier Scenic RR, Stathi, stands with one of our drivers. 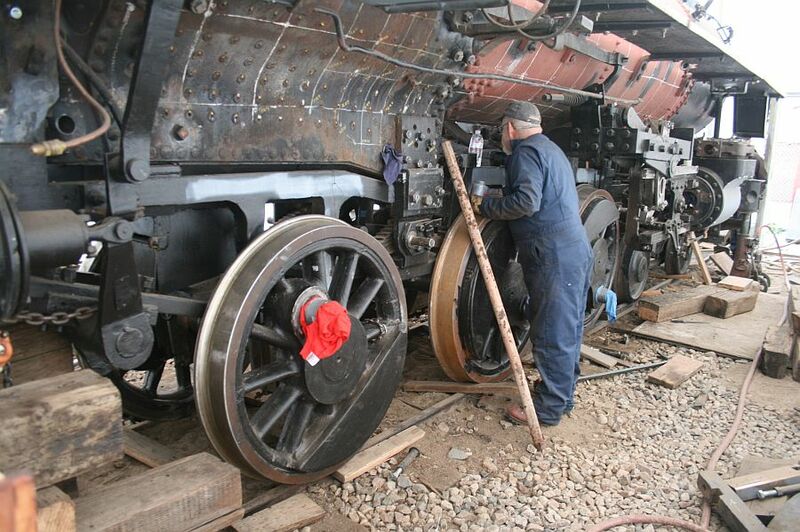 With the drivers back in Independence, the subsequent work over the weekends of the 23-24th and March 1-2nd have put the locomotive back on the rails…..almost. The big pushes on the 23rd and 24th were to unload the drivers, get the driver boxes assembled on the axles with new grease cakes and most importantly, complete the layout and machining of the shoes and wedges, know as tramming. Travis and Dave setting a driver on the rails. Feb 23rd. 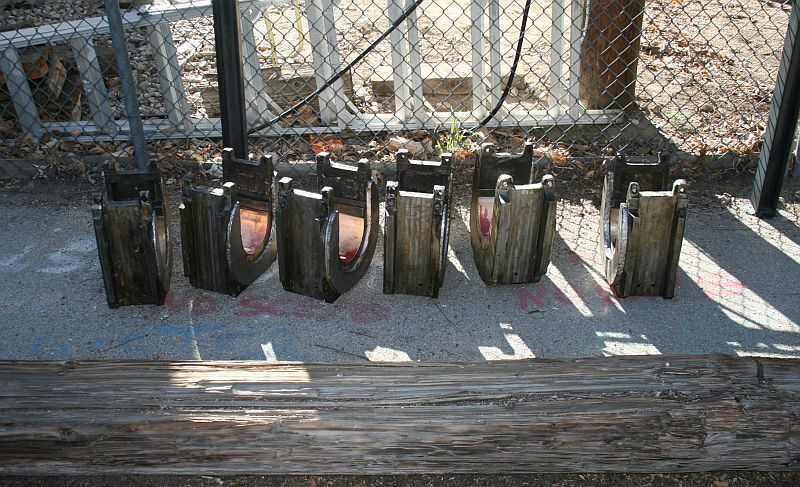 The driver boxes are all sitting ready to receive the final grease grooves and be installed on the axles. The finished job, all the boxes ready to go with the grease cellars repaired and repacked. Note the new axle on the #3 driver farthest away in the photo. Aside from the driver prep work, we also installed the steam dome lid, finished the left boiler check valve and installed all the boiler plugs. All that’s remains is to roll the tubes in place and fill the boiler with water. Marty and Scott spent most of the weekend lapping the right valve in place. Aside from some quick machining the valve is about together. 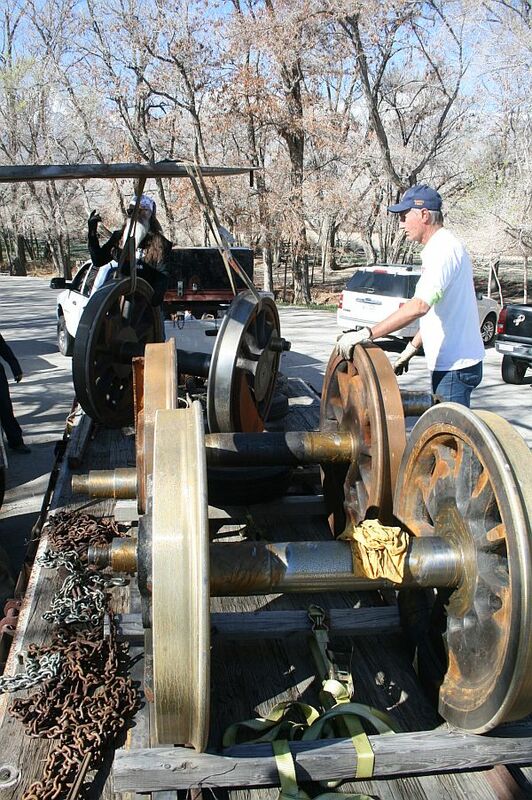 With things more or less ready to go, a group of a dozen volunteers arrived for the big weekend of March 1st and 2nd. First off, thanks need to go to the Virginia and Truckee Railroad for kindly loaning us their four Duff-Norton high lift pneumatic jacks for the weekend. After spending a few hours taking care of a couple small items that were missed the previous weekend it was time to lift, and lower. The first job was to go up one lift to have the engine high enough for the drivers to clear as well as remove the frame binders which go under the frame openings. Clear track and getting ready to lift. 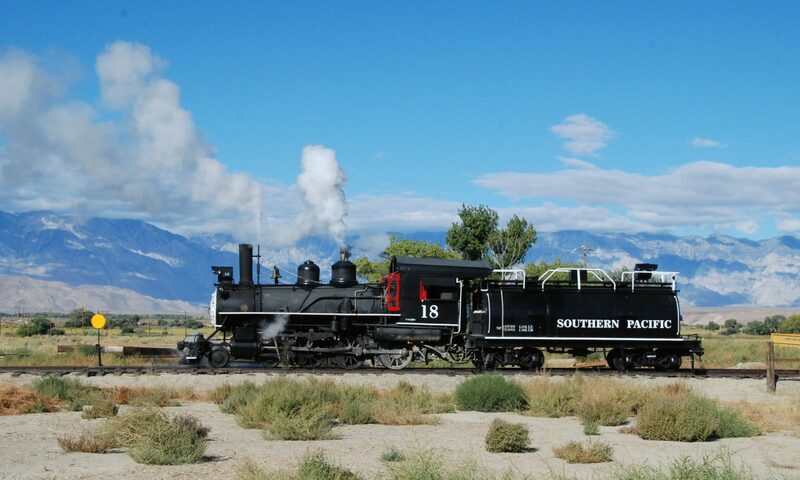 As high as we need to be with the locomotive. The drivers are in place and the engine is coming back down. 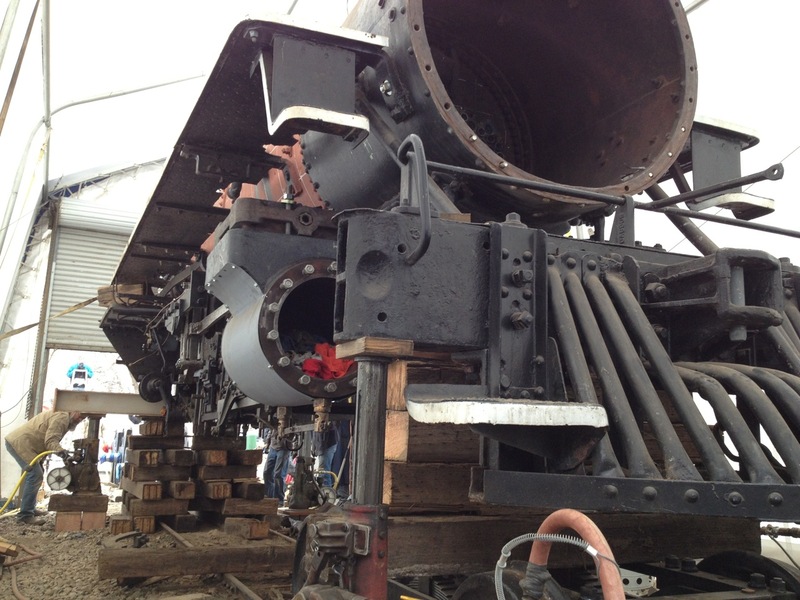 With it past dinner time on Sunday, the engine is almost back to earth and on the wheels. Once the wheels were rolled in place, the engine was slowly lowered back down, and that’s when the frustrations started. 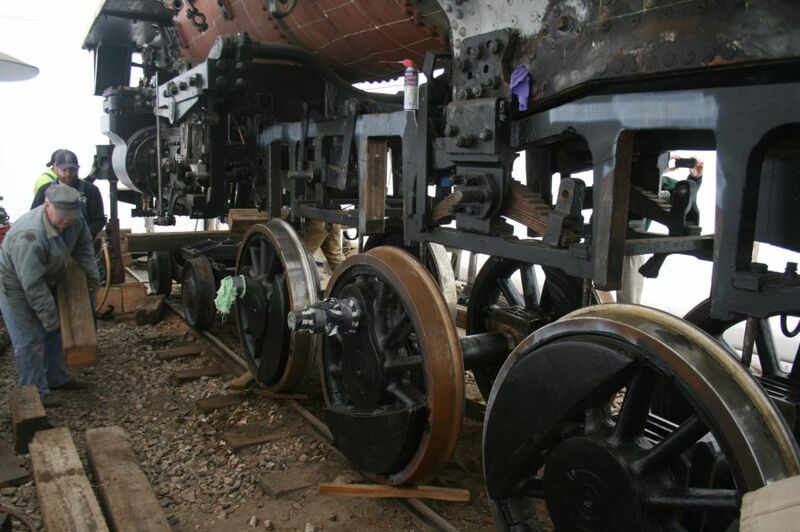 During the process of lifting and lowering the engine for the removal of the wheels the engine had shifted about 3″ to one side of the rail line, before things could go back together it had to be shifted back over. To do this safely with the engine on jacks was a chore. 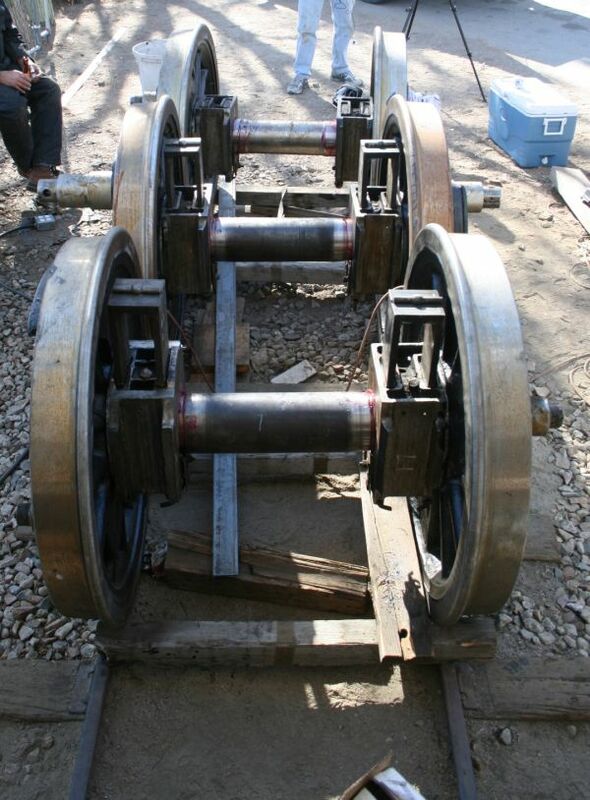 The jacks were set at a slight angle and the engine was repeatedly lifted and lowered to inch it over, once close, the engine was then lowered over the wheels and small hydraulic jacks were used to push it the last 1″ into alignment. All totaled, it took the crew until about 9pm Sunday night to have the engine back down and almost in place, it is still blocked up about 4″, or just above the point of where the spring rigging will begin to take the weight. 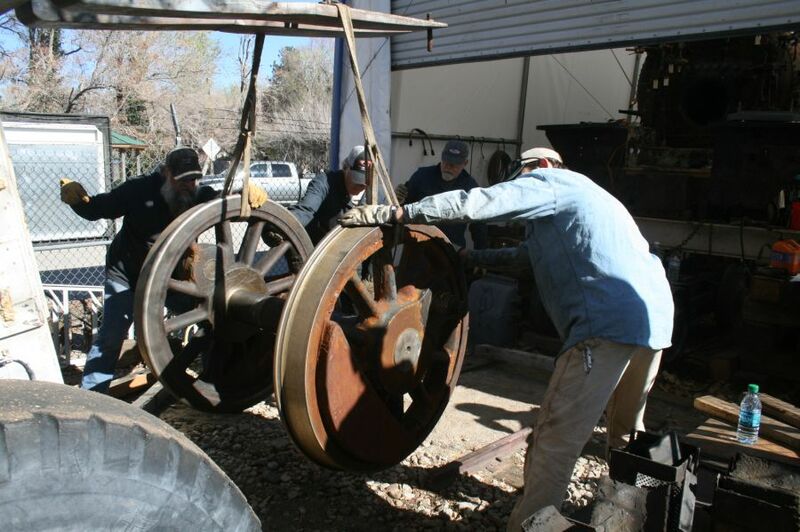 As if all the locomotive work wasn’t enough, a few guys worked over at the museum inventorying rail and track components as well as moving out scrap iron in an effort to get the new museum site ready for track later this year. Finally, a big THANK YOU to everyone who has helped over the course of the month on this big project, we couldn’t have done it without you! Some of the crew that made this all possible enjoying another Independence lunch.